Here is your weekly reminder of Psalm 19 — our galactic home, the Milky Way. This graceful arch across the sky is our home, as seen from within the Galaxy itself. The Milky Way is a spiral galaxy, about 100,000 – 150,000 light-years across. It contains an estimated 200-400 billion stars, including our Sun. 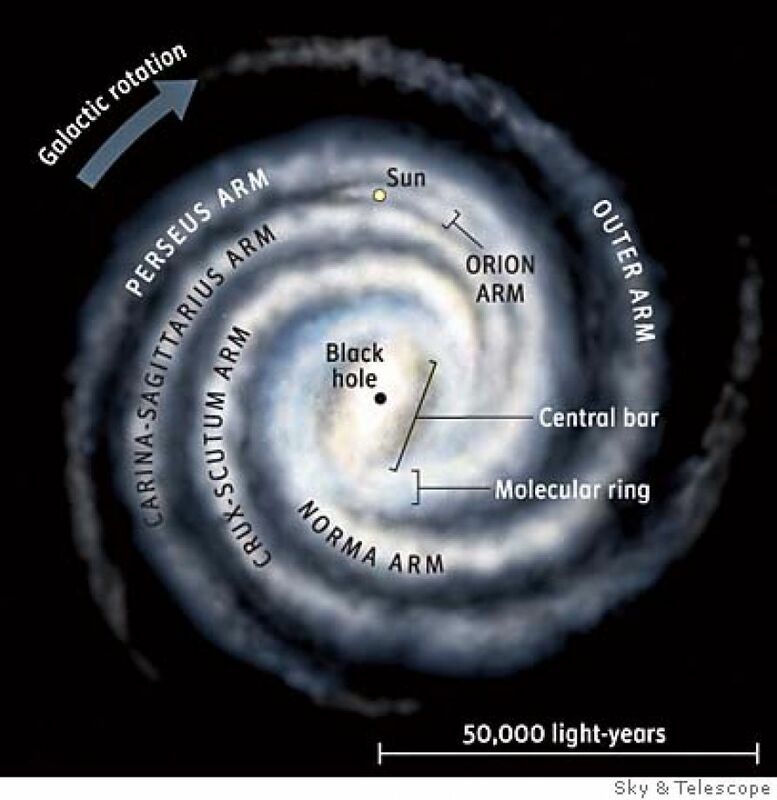 The Solar System is located about 30,000 light-years away from the center of the galaxy at the edge of the Orion arm (see image below). Incidentally, did you know there are stars between the arms in a spiral galaxy? Quite a few actually, but many of them are not visible because they are dimmer than the very luminous massive stars that tend to bunch up in the arms. The Milky Way has a supermassive black hole in its center, just like every other galaxy that’s been observed. It weighs in at about 4 million times the mass of the Sun, which may sound like a lot, but is kind of “meh” as far as supermassive black holes go (some of these giant black holes tip the cosmic scales at 10 billion times the mass of the Sun). If you wanted to look in the sky in the direction of this black hole, called Sagittarius A*, you would look at the Milky Way in the direction of the constellation Sagittarius. You wouldn’t see anything that suggests a black hole, especially because it’s smaller in size than Mercury’s orbit around the Sun, but it’s sort of fascinating to know that it’s there nevertheless. Milky Way image credit: Steve Jurvetson. Milky Way schematic credit: Sky & Telescope magazine. That was a really good video, but why was he in a jacket in front of a green screen? It’s kind of chilly in a virtual forest?